A two-storey hotel that wraps around a large courtyard pool, this wellness-centric resort and spa is an oasis close to Hoi An old town. Ad Book now! Rates from US$146++. Average rating 8.9 from 834 reviews. The multi-tiered pool is the property’s best feature. 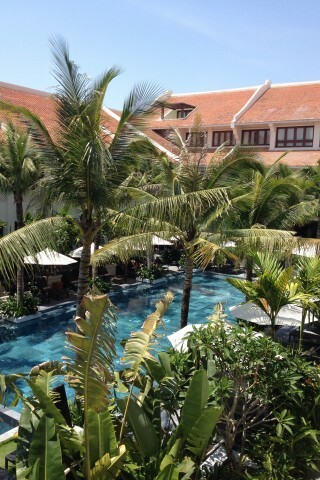 Surrounded by palms, sun beds, tables and umbrellas, it’s large enough so everyone can spread out. At the far end, stairs sweep up to the spa, the hotel’s second selling point; the room rate includes one spa treatment. The lofty spa lobby is a serene space, and offerings include manicures and pedicures, massages, sauna and complimentary yoga. The rooms themselves are calm and comfortable, decorated in neutral and soft hues, clean contemporary lines and elegant furnishings. Patterned tiles and antique style fixtures add some personality, as does the balcony. Rooms include a minibar, very comfortable bed, flatscreen TV, WiFi, safety box, kettle and bathroom amenities. All guests can look forward to a generous breakfast buffet spread. Almanity is for those with a little more to spend. It is fantastic value if you get a deal off the rack rate. We noticed significant discounts on online booking sites compared to the regular rate. It is located northwest of the old town, about a 15-minute walk or a quick taxi ride away. Check rates at Almanity on Booking.com.